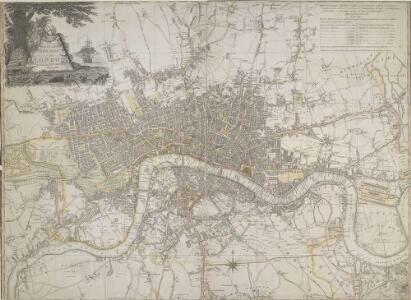 Description: This is a later edition of Laurie and Whittle's folding map of London, first published in 1804. The title appears as an old inscription on an illustrated pyramid at top left, also showing city arms, ship, flag, anchor, flora and fauna. Explanation of symbols and abbreviations is given above the publisher's imprint at top right, with compass star at bottom centre. The border of the map is marked off in furlongs. Proposed works, including the Vauxhall and Waterloo bridges and their approaches, are highlighted in yellow.